Chambers Europe 2011 pk en | Regulacje, konkurencja i odpowiedzialność za produkt | KRK Kancelaria Prawna Sp. J. The Kieszkowska Rutkowska Kolasiński law firm was established by recognised experts in pharmaceutical and medical law - Paulina Kieszkowska-Knapik, Advocate, Ewa Rutkowska, Advocate, and competition law - Marcin Kolasiński, Legal Advisor. The law firm comprises an experienced team, which has worked with the founders for a long time. We all have many years of experience of working in international law firms (including Baker & McKenzie, Hogan Lovells and CMS Cameron McKenna). 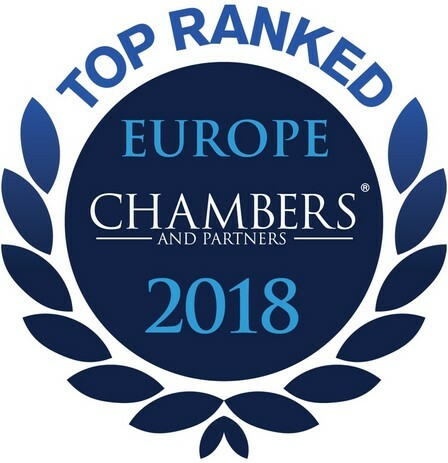 We have been regularly recommended as leading lawyers in pharmaceutical law and competition law by Polish and international rankings of law firms and lawyers, such as Chambers Europe, Legal 500 and Rzeczpospolita. The Chambers Europe 2014, 2015 ranking acknowledged our law firm as the best Life Sciences practice in Poland. "Lawyers are very well connected and are very proactive in finding solutions." "They understand the business, they listen carefully and are attentive to clients' needs." "The firm is very specialised in the pharmaceutical sector." "They are very hands-on. They always tailor their advice to our company's needs and work very well within limited timeframes." Competition/Antitrust oraz Dispute Resolution - KRK Kieszkowska Rutkowska Kolasiński ranked Tier 4 in Competition/Antitrust and recommended in Dispute Resolution. "They adopt a tailor-made approach and really adapt to the needs of clients." "They fully understand clients' needs. What is very important for me is that they are flexible in looking for effective and safe solutions for the business." "I decided to work with them as their technical skills and knowledge are extremely good and helpful." "Nothing to improve! It's my favourite law firm." 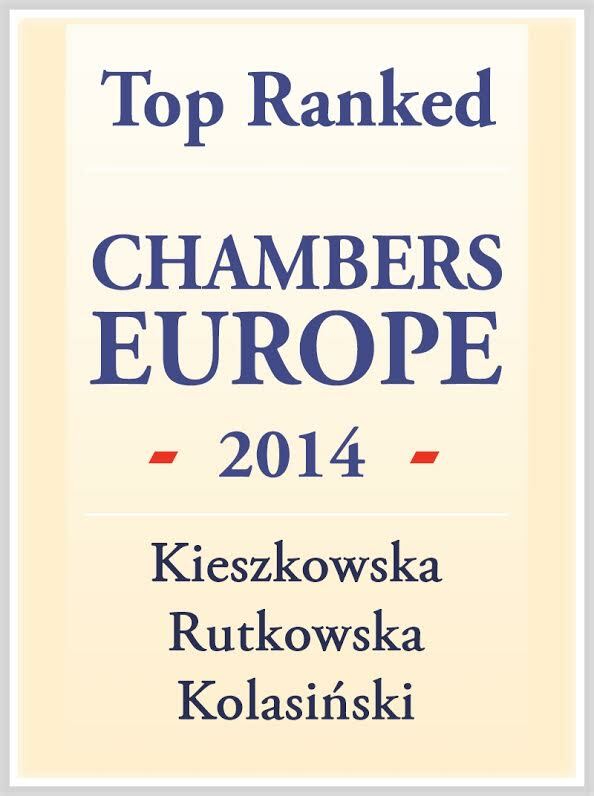 KRK Kieszkowska Rutkowska Kolasiński ranked Tier 4 in Competition/Antitrust and recommended in Dispute Resolution. KRK Kieszkowska Rutkowska Kolasiński - Group 1 for the second time in the category of Pharmaceutical Law and recommended in the category of Competition Law. "Distinguished and specialised boutique law firm acting for established clients in the pharmaceutical, medical, food and cosmetics sectors. As well as regulatory issues, it advises on issues within competition law and legal aspects of business-to-consumer relations and public procurement. Also experienced in product liability and product safety issues". "This team has very in-depth knowledge of the pharmaceutical industry. The lawyers are the number one specialists and are very responsive and pragmatic." "The lawyers are very good: they are very flexible and very responsive." 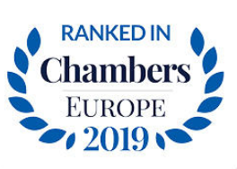 "Recently established Warsaw-based competition boutique joins the rankings as a result of strong recognition for its competition and antitrust expertise. Advises on merger control, regulatory and compliance issues. Notably popular amongst pharmaceutical clients, but also advises companies from the energy and media industries". "I'm very satisfied with this team. The lawyers are very responsive, constructive and focused on finding solutions." "The lawyers are able to objectively evaluate risks and losses. The team is receptive to our needs and operates very quickly." Competition/Antitrust oraz Dispute Resolution - KRK Kieszkowska Rutkowska Kolasiński recommended. KRK Kieszkowska Rutkowska Kolasiński – Law firm of the year – Poland. 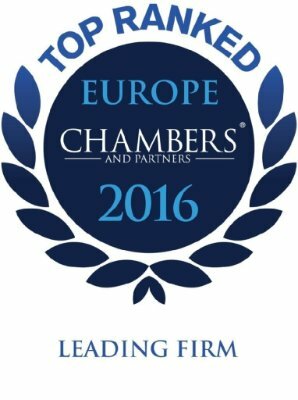 "Market-leading boutique well known for its expert knowledge of pharmaceutical law. Assists international pharmaceutical clients with contentious and advisory matters, including reimbursement, public procurement, regulatory advice, distribution and marketing. Provides additional expertise in competition law and product liability litigation." "It's leading the market in the area of reimbursement." "The lawyers really care for the client and have huge knowledge." "We use the firm for difficult and strategic matters." "Market leading life sciences practice highly reputed for pharmaceutical knowhow. Singled out for regulatory work and additionally focused on the medical, food and cosmetics industries. Paulina Kieszkowska-Knapik and Ewa Rutkowska recently left Baker & McKenzie with Marcin Kolasiński to set up a regulatory and competition spin-off, Kieszkowska Rutkowska Kolasiński. They were joined by other colleagues including Natalia Łojko." 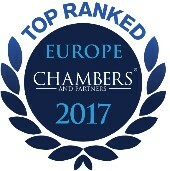 Paulina Kieszkowska-Knapik - Paulina Kieszkowska-Knapik is the leader in this ranking tor the 12th time in Pharmaceutical Law. Paulina Kieszkowska-Knapik - recommended in Medical Law. Who’sWho Legal 2018-2015 (Life Science) - Paulina Kieszkowska-Knapik recommended. Paulina Kieszkowska-Knapik – 61st on the Puls Medycyny List of the Hundred Most Influential People in Healthcare, 2017, which has been published annually for over 10 years. Rzeczpospolita Contest Lawyer of the Year 2016 - Paulina Kieszkowska-Knapik – precedent case lawyer. Paulina Kieszkowska-Knapik – 45th on the Puls Medycyny List of the Hundred Most Influential People in Healthcare, 2016, which has been published annually for over 10 years. "Revered by practitioners and clients alike, Paulina Kieszkowska-Knapik is considered a star pharmaceutical lawyer. Clients appreciate her quick advice, saying: "She is very passionate about what she is doing" and "always fights to the end." She is renowned for her knowledge of reimbursement and the healthcare system." 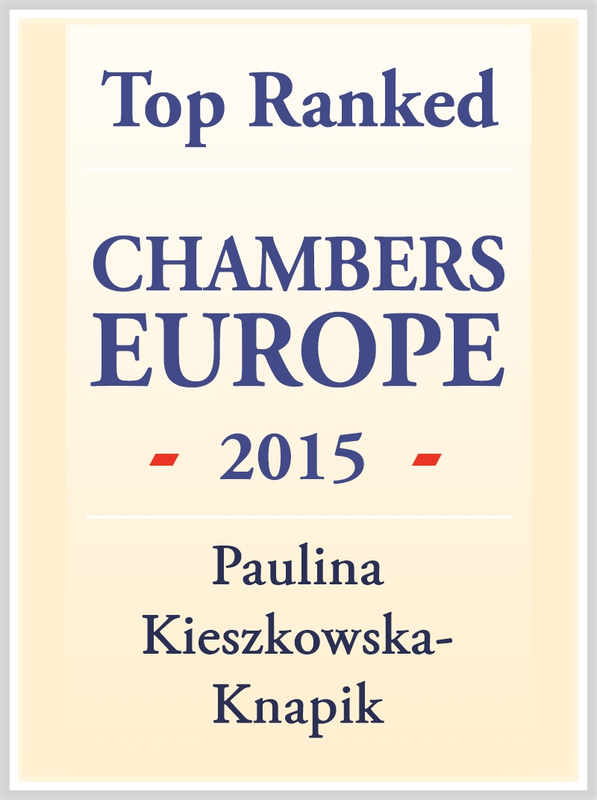 "Paulina Kieszkowska-Knapik is an acknowledged authority in the sector, particularly for pharmaceutical and healthcare law. One client notes: "She has very deep knowledge and is one of the most experienced lawyers in the market."" "Paulina Kieszkowska-Knapik is "knowledgeable and passionate. Her power is in her expertise – there is nobody out there who understands these matters like she does." She has broad experience of working with all major life sciences companies and institutions in Poland." Paulina Kieszkowska-Knapik (position 37: 2013) – (…), co-founder of Lege Pharmaciae foundation, rise from position number 39 (2012). "Paulina Kieszkowska-Knapik is singled out for her "in-depth and client-friendly approach." "I admire her brilliance and business understanding," another source adds. She co-heads the department, focusing on regulatory, competition pricing and reimbursement matters." "Interviewees agree that Paulina Kieszkowska-Knapik is one of the market's standout lawyers: "She is extremely knowledgeable in regulatory aspects, widely respected and straightforward with her proposals."" Paulina Kieszkowska-Knapik - Life Sciences. Ewa Rutkowska - recommended for the 10th time in Pharmaceutical Law. Who’sWho Legal 2018-2015 (Life Science) - Ewa Rutkowska recommended. Who’sWho Legal 2018-2015 (Product Liability Defence) - Ewa Rutkowska recommended. Expert Guides 2018-2015 (Product Liability) - Ewa Rutkowska recommended. Expert Guides: Women in Business Law 2018-2014 (Product Liability) - Ewa Rutkowska recommended. “Ewa Rutkowska is a renowned expert who focuses on pharmaceutical, healthcare and product liability laws, with extensive experience in advising domestic and international companies in the pharmaceutical, FMCG and medical device sectors. Her expertise in product liability litigation is evidenced in high-profile cases pertaining to worldwide product recalls, and she receives extensive praise from satisfied clients: She is an expert in this subject, with a very good legal background. She is able to advise taking into account the business aspects of the clients." "Ewa Rutkowska receives praise from clients for her excellent communication skills. "She can easily explain things to non-lawyers, which is very important." comments an interviewee. Another adds: "She has a lot of energy and gives good, proactive advice." Ewa Rutkowska has extensive experience in representing pharmaceutical clients in product liability litigation." "Sources say Ewa Rutkowska "has practical knowledge about local and EU law, and is very open to discussion and able to consider difference scenarios." She is particularly active in pharma and product liability litigation." 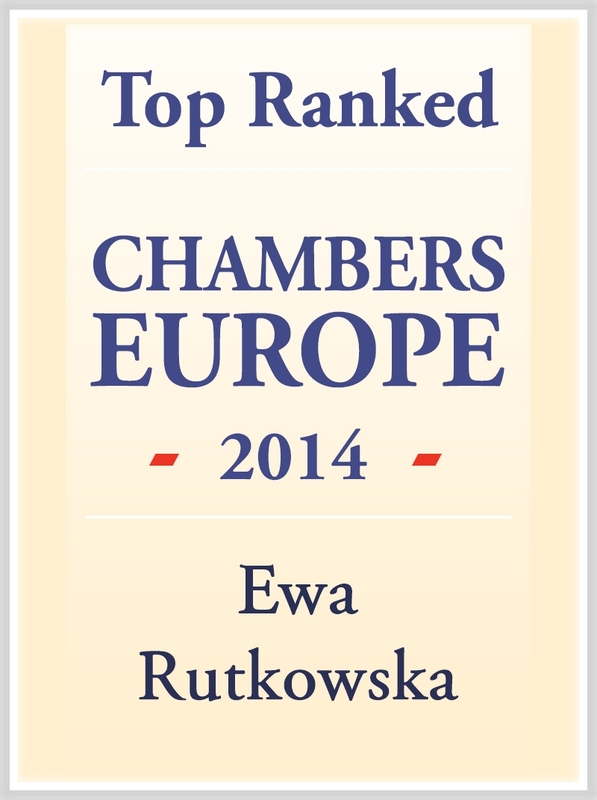 "Ewa Rutkowska is revered as an "efficient lawyer with a brilliant mind and client-friendly approach." She has knowledge of the full range of life sciences law, although she has recently been particularly active in product liability cases. Sources also compliment her clear advice." "Peers describe practice co-head Ewa Rutkowska as "a highly skilled lawyer." She handles regulatory, commercial, product liability and reimbursement matters." "Ewa Rutkowska is also singled out as "a brilliant practitioner."" "Ewa Rutkowska is widely respected for her constructive approach: "She has a very good attitude, explains things carefully and in depth, and has the patience to push things through to the end without creating animosity."" "Both Ewa Rutkowska and rising star Agnieszka Zielińska-Krywoniuk are reported to be excellent at handling highly sensitive situations. Rutkowska is renowned for approaching issues from multiple perspectives and receives the highest of praise from one client, who is adamant that “you couldn’t ask for anything more in a lawyer."" 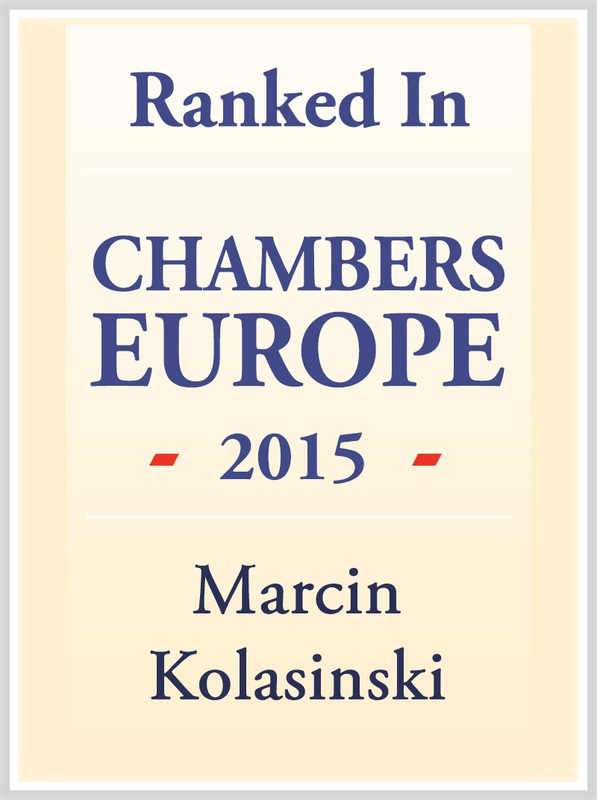 „Marcin Kolasiński remains a first port of call for pharmaceutical companies seeking antitrust expertise. He has broad experience in handling matters such as abuse of dominant position, merger control proceedings and day-to-day compliance. A client reports that his advice is "straight to the point, concise and very focused". 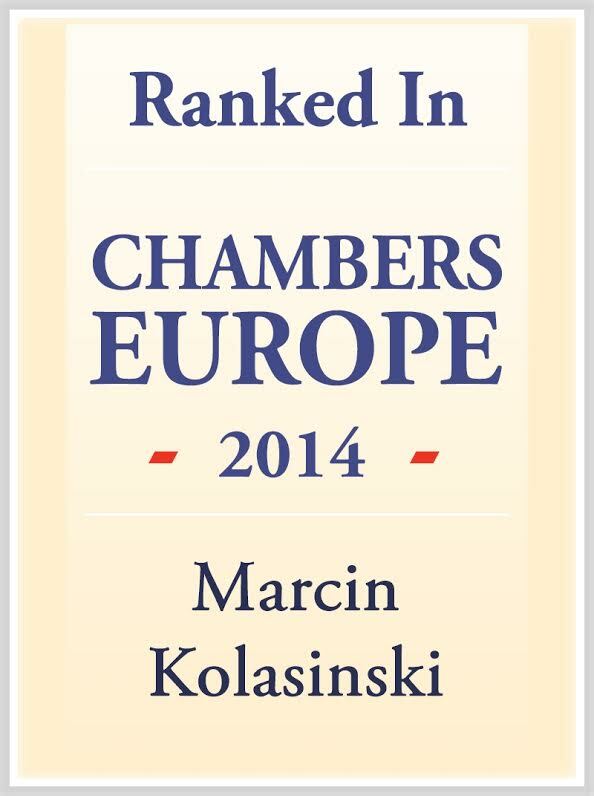 Marcin Kolasiński - recommended in Competition/Antitrust. 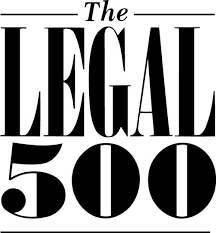 Who’sWho Legal 2018-2015 (Competition) – Marcin Kolasiński recommended. Expert Guides 2018-2015 - Competition/Antitrust – Marcin Kolasiński recommended. “Practice head Marcin Kolasiński is a well-established name in Polish competition law, with a solid track record in merger control, antitrust proceedings and regulatory compliance matters. Sources praise his "great strategic and tactical mind," with another client adding: "I like his approach to problems, whether business or my personal concerns. I can always rely on him." "Marcin Kolasiński of Kieszkowska Rutkowska Kolasiński is best known for advising pharmaceutical clients on day-to-day competition issues concerning distribution, compliance and advertising. He is recommended by clients as a "sharp and experienced lawyer with excellent knowledge of the regulatory environment in Poland."" "Marcin Kolasiński recently left Baker & McKenzie to set up boutique firm Kieszkowska Rutkowska Kolasiński Kancelaria Prawna Spółka Jawna with Paulina Kieszkowska-Knapik and Ewa Rutkowska. He moves up in the rankings due to excellent client feedback. Impressed interviewees say: "He is proactive and very much liked by business colleagues, and he can really explain matters in a way that people can understand." He has almost ten years' experience in advising clients in this area." "Marcin Kolasiński is noted for his expertise in the pharmaceutical sector. Clients indicate that he is “worth every penny” and appreciate the way he “understands the business and addresses its needs."" "Very professional” (…) Marcin Kolasiński heads the practice, and ‘creatively challenges the status quo to find new strategies’." "Interviewees regard Marcin Kolasiński as "a creative, solution-driven and extremely knowledgeable practitioner."" "Marcin Kolasiński is "a fantastic lawyer with great understanding of the pharmaceutical industry and the requirements of the competition authorities," say sources." “Clients praise Marcin Kolasiński’s "brilliant mind, analytic personality and pro-business approach"”. "Marcin Kolasiński is seen by sources as a dynamic leader of the practice. He is especially well regarded for his abilities in cases relating to the pharmaceutical industry." "Marcin Kolasiński is singled out for showing great promise." Expert Guides Rising Star 2018-2015 - Natalia Łojko recommended. “Natalia Łojko is a highly regarded pharmaceutical lawyer focusing on reimbursement matters. She rises in the rankings in recognition of her experience in the field." „Marek Świerczyński advises pharmaceutical bodies on a broad range of pharmaceutical legislation, with particular strength in clinical trials, reimbursement, advertising, distribution and IP."